The United Kingdom was honoured to receive the man who wrote the law on medical ethics in Israel. 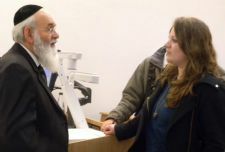 Professor Avraham Steinberg flew over from Israel to speak to Imperial College students and interested parties about the ethics of ending life. He headed the committee in Israel which wrote the Dying Patient Act 2005. The talk was opened by Professor Edwina Brown, who posed the question: is extending life really extending dying? Prof. Steinberg didn't address this issue in as many words, but he gave enough information for us to think about that ourselves. The talk opened with a couple of jokes, to ease the tension on a rather sombre topic. Steinberg was anxious to emphasise that the end of life dilemma is primarily social - encompassing ethics, legality, religion and culture; it is not just a medical issue. Over the past 30 years, exponential changes in technology have put the medical field in a position where is has never been before. Today, there are so many ways to prolong patient life that ethics is a serious consideration. In 1976, Karen Ann Quinlan entered a vegetative state after mixing a number of legal drugs. Her parents pressed for her to be removed from a ventilator, and after long court procedures, she was taken off life support. Despite the fact she lived for another decade, this case exemplifies the slippery-slope nature of ending life. Karen Ann Quinlan has been in the centre of the "Right to Die" debate. Once it became acceptable to remove life support, stopping foods and fluids became commonplace, leading to the Oregon Act 1994. This enables patients with a life expectancy of under 6 months to receive lethal injection. Although Kevorkian is universally regarded as a second-degree murderer, the fact that his actions were considered ethical by those who chose to use him exemplifies the grey area in which Steinberg treads. Four united sub-committees of personnel from medical-science, law, philosophy-ethics and halacha (Jewish law) comprised the committee of 45 men and 14 women. The debates proceeded with mutual respect and after 2 years, 95% of the laws were accepted by all committee members, and 80% of committee members accepted everything. The law was monumental in defining a dying patient. A patient is dying if they are suffering from an incurable medical condition where, with any medical treatment, life expectancy is under 6 months. A patient is in the final stage of life if they are in a medical condition where a number of vital systems are at end-stage failure and life expectancy with medical treatment is under 2 weeks. In all of these decisions which must be made, it is a balancing act between the patient, treatments, decision-makers and procedures. There are three types of patient who are dying: currently competent; previously competent, now incompetent; and incompetent. The first are 17 years of age or more, able to express their wishes, and not declared incompetent. Their wishes are therefore followed. In the case of the second type of patient, physicians must follow advance medical directives (AMD), a close person's statement, or a court-appointed surrogate. The AMD is legally binding, renewed every 5 years/after diagnosis of a life-threatening medical condition, and held in a national database. Currently incompetent patients are dealt with via a National Ethics Committee (which is instead of court of law). Steinberg examined both the Halachic and secular perspectives, and came to the conclusion that in areas such as withdrawing continuous life support (e.g. respirator), the former says no, and the latter says yes. Unfortunately time ran out before he could elaborate further and delve into the ethics of treatment. Anthony Warrens ended with question time, which was far too short, but broached on the subject of the ethics of suicidal patients. The answer was to refer them for psych analysis. All in all, the talk was exceptionally informative, and made the fitting point that this can be applied in any country - just swap the Halachic sub-committee for any religion of your choice!